Now nearly 25 years old, he currently works as an exterminator For Bug Off Pest Control. Roy hasn't lost sight of his dream and still insists, even after three years of pest control experience now under his belt, that it's only temporary. He doesn't take his job seriously, and often makes crucial mistakes, like mixing together the wrong lethal chemical combinations and smoking near the flamable toxins (which has backfired on him more than once). He would have honestly been fired long ago if not for his trainer, Wesley Feelus, who still accompanies Roy on many jobs. Roy may not fully comprehend the systematic nature of extermination, but, due to his superiority complex, he loves the sadistic feelings of power and control he has over the insects he kills and sometimes tortures, if he finds one. He loves to watch them writhe as the poison sets in. Roy enjoys abusing insects, but certainly isn't afraid of them, and will even pick one up, if he has a special means of destruction in mind. During most days, he he's clocked in as an exterminator, but some nights he preforms or practices with his band, Narcissus, as the lazy, arrogant, lead guitarist/vocalist. Btw, his band members don't think too highly of him, though, they dont want to drop him cuz Roy is usually the one who gets them gigs, and, as much as they might hate to admit, is damn good at what he does. -Personality wise, Roy's a pretty laid back bloke. -He's extremely over confident and rarely ever nervous. Has a massive crush on character Wizzie Belles. 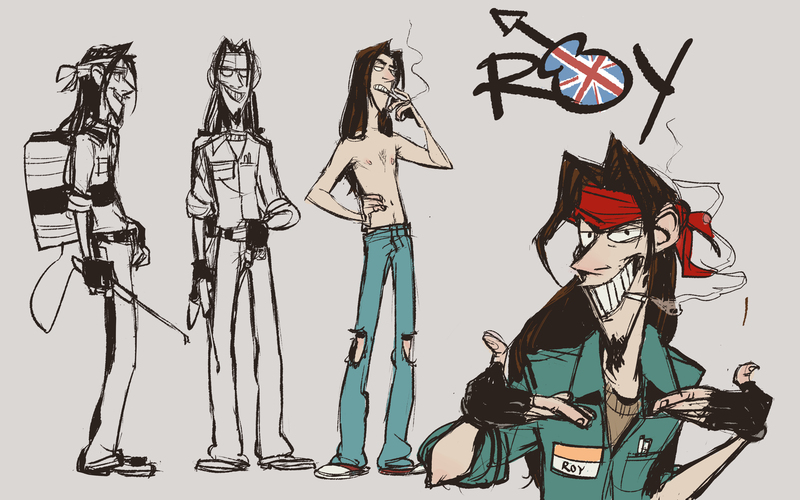 ***Roy used to have a roach form so you may see that is some of his comics, buts it has scince been nixed from his bio here on void.